I'm ashamed to say I can't remember which BookLiker introduced me to this series of The Others by Anne Bishop, but I'm so glad they did. 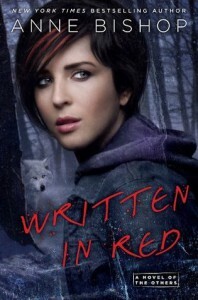 I loved "Written in Red". It has a unique world, and a unique take on the whole shifter and vampire thing. It's original and compelling, and the revelation of more and more strangeness is compelling. The characters are consistent and coherent in their differences. Stands up really well to re-reading. I did struggle a bit with the heroine's self-harm issues. She "has to" cut herself to speak prophecy. But it is well handled and I think the blurb and discussions of the book provide trigger warnings by what they say.